In came across these bags in the alley adjacent to Parc. In the back was some original art I took an interest in. It looks to be signed by a Bobby Atkinson. 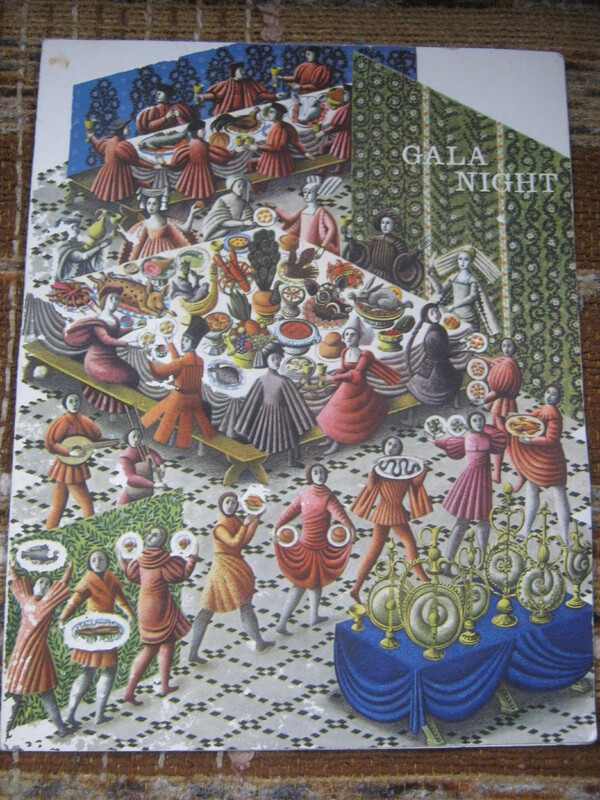 A woman by the same name published a book of watercolour scenes of Montreal and Quebec in 1970 in the same style as the one I found. Also, the signature in this signed copy of her book looks like a match. It’s a really well done piece. I took it out of it’s busted frame and brought it home. A box of circuit breakers I came across on St Urbain. I brought them home but I have no real plan for them. If anyone has an interest in these send me an email! 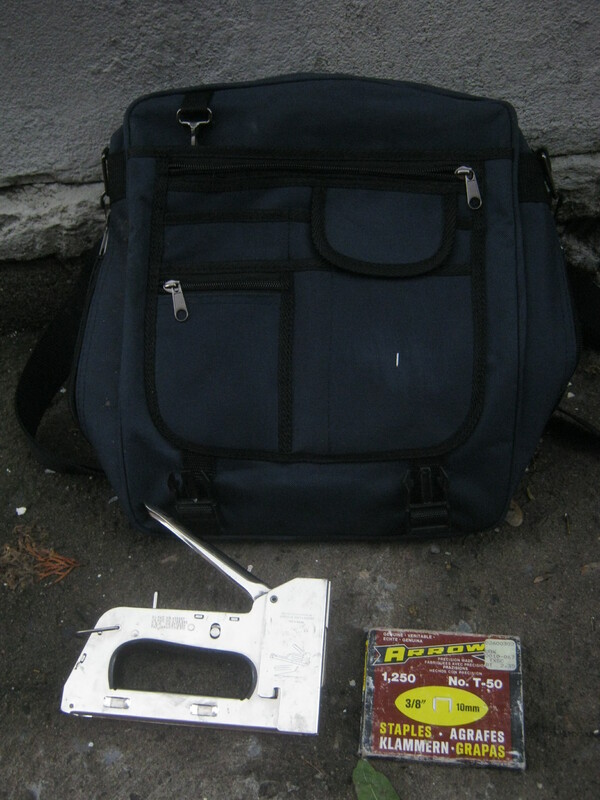 I also found this backpack with a working staple gun (with staples) inside. I’m going to keep this for myself as these things come in handy. Overall no motherloads today but I’m pretty happy with the little (and big, in regards to the floor lamp) things I salvaged. 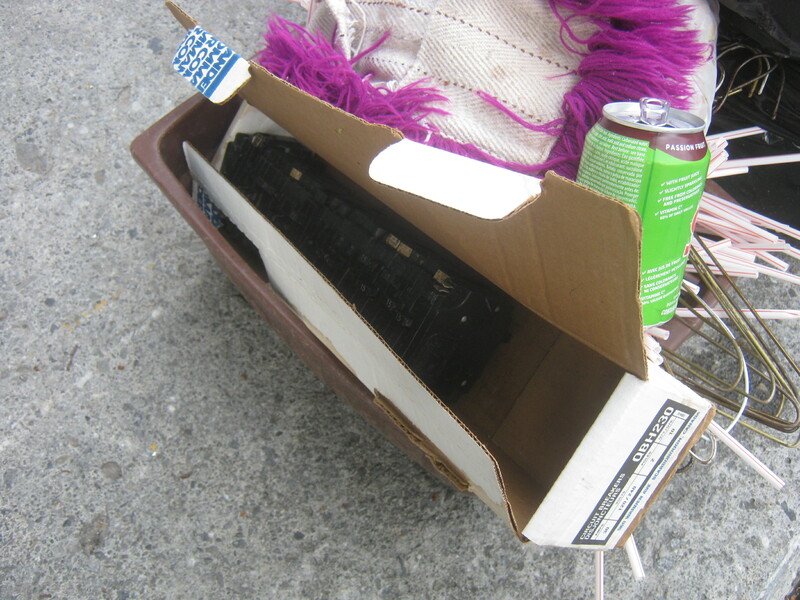 Here’s something I recovered from the trash of the unwelcoming woman on Tuesday. 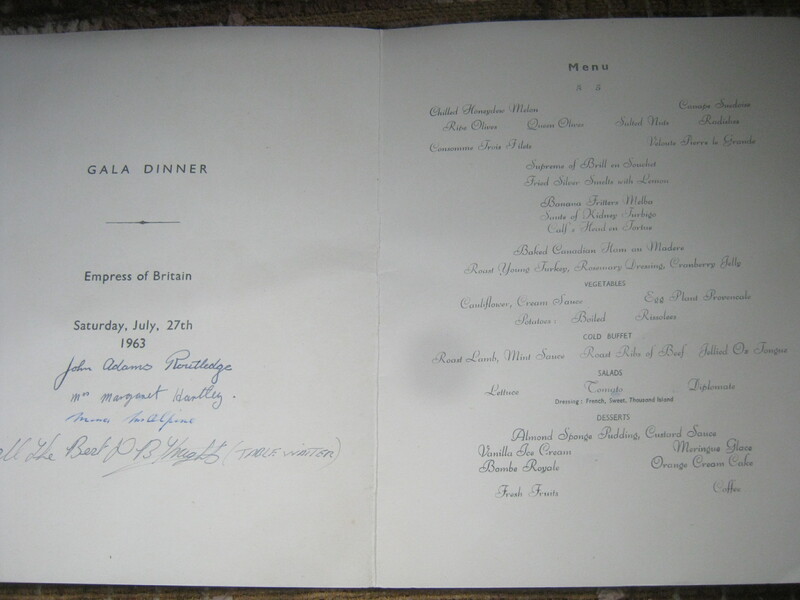 It’s a menu from a July 27 1963 dinner on the Empress of Britain, which was a ship of the Canadian Pacific Steamship Company which regularly traversed the Atlantic in the 50s and 60s. The ship was sold to a Greek company in 1964 and exchanged a few more hands before finally being scrapped in 2008 at the age of 53. I looks like it was a pretty fancy meal based on what was on the menu. Then again there’s also something called “Calf’s Head en Tortue” which just sounds weird. If you feel like seeing what’s on the menu click on the picture and zoom in! Tomorrow morning I’ll be checking out the neighborhood of Villeray. I’ll keep you posted as to how it goes. You may have seen this but just in case you haven’t….a bit of inspiration. I’ve seen it. It’s pretty impressive what they’ve done from trash! I’d like for our culture to use our resources even half as effectively. I am so glad you didn’t find a calf’s head in the trash. That is exactly what I thought when I read the title of this post. 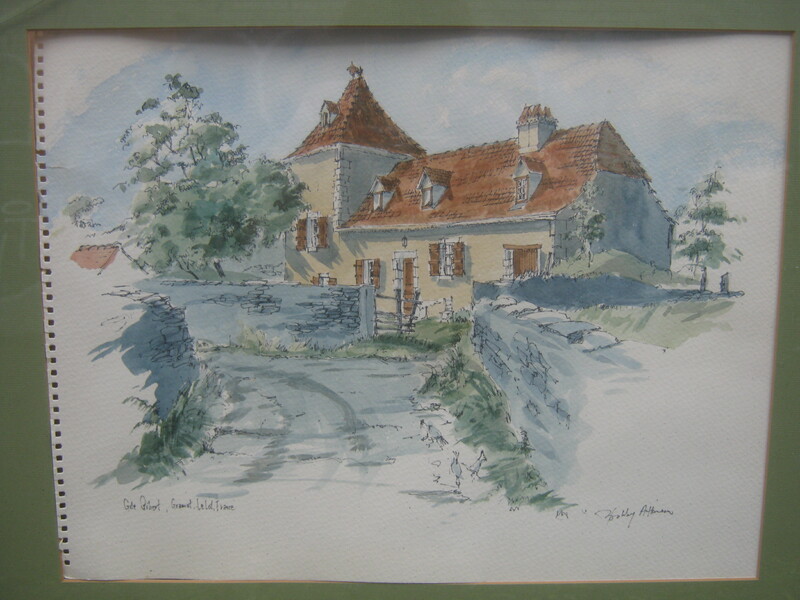 Whatever the case, the subject matter of the watercolour is in France (so she must have trained/travelled there at some point). If you can pinpoint where (I can’t quite make it out from the photo you posted), you can place an ad on the French craigslist (http://paris.fr.craigslist.fr/ara/), or some similar site. If people there know the place, they’re the ones that will pay best dollar for the watercolour. That’s probably the same artist as the painting is a scene of somewhere in Quebec. Hmmm … AVG removed a threat when I opened that page, so I was unable to see the watercolour you were referring to. (Threat name: Exploit Blackhole Exploit Kit – type 2602). Hope you have a free virus program on your computer. My computer only shows a blank page; AVG blocks it entirely. The watercolour is wonderful.I wonder where it is?Geographically,I mean.Did the Bobby Atkinson woman,perhaps do watercolours of people’s houses for them?It’s lovely. The writing on the bottom left notes that it’s in France. It’s a place called the Gîte Gibert (apparently a gîte is a holiday home available for rent in France). Maybe she vacationed there? 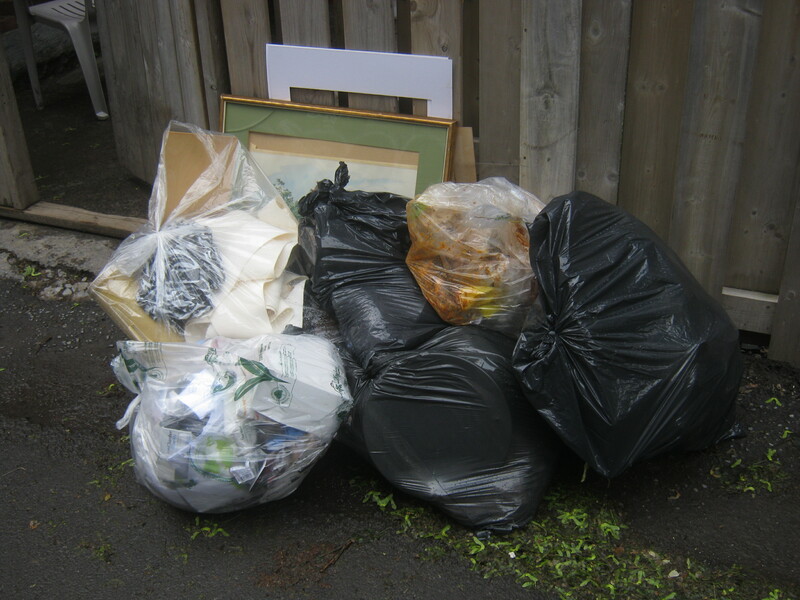 Your painting finds are wonderful.It is a pity you can only cover four of Montreal,s 19 boroughs.I wonder how much art is thrown out in other boroughs and how many people go around scavenging like you.Many people do scavenge for bottles,cans,and scrap metal.But I have seen many bottle scavengers leave great art and knicknacks untouched.Once I saw a young woman pull out both knicknacks and beer cans from a recycling bin with a lid;in NDG;she rescued the knicknacks and wall frames and took away the beer cans as well.She was well-dressed.Apparently she did this only sometimes.I wonder how many people are all-round scavengers and not in just for bottles and cans. I am delighted you found and took home this great painting.I just want to tell you tomorrow Sunday there will be the Montreal Anarchist Book fair at CEDA development centre on Delisle street near Lionel Groulx metro.Tomorrow is the last day.This book fair involves book sales,activist kiosks,environmental activist meetings,anti-capitalist groups,etc and a lot of vegetarian/vegan food.A lot of anti-capitalists,intellectuals,activists,environmentalists and dumpster divers visit the fair.The fair will continue on Sunday,May 26,2013 between 10 am or 11 am to 5 pm.You should visit it and meet a lot of like-minded people.In going there,you can bike through more of the Sudouest borough.Monday morning is also garbage/recycling pickup day in the southern part of St.Henri so you could check out the trash there on Sunday night.The Anarchist book fair is actually held in Vinet Park and the CEDA building.The book sales and the activist kiosks are in the building.The food tent is in VInet Park.On Saturday despite the rain there were many people at the Anarchist book fair,only slightly down from last year.Please go there tomorrow.Best wishes,Solomon. The Gay village is just below the Plateau,very,very accessible by biking.There are a lot of new condos and apartment buildings in the gay village.You haver never really reported on checking the trash in the Village.Do you go there?You might find great stuff there.Please visit the area from time to time. Wow! That’s a beautiful painting!! Professional organizers tell people to purge everything they have not used recently and donate or throw out stuff.If you listen to them,you would not keep almost anything.I lived in Brazil and the Philippines for two years each before coming back to Canada.There people buy less stuff but hold on to that longer.I know a person who followed the advice of a professional organizer and purged a lot of old art and vinyl records and regretted it.I do my own purging periodically,but very selectively.Do not listen to many professional organizers—they preach radical solutions.Many of us do not agree with that.